All 64 non-smoking superior rooms are equipped with air-conditioning, free internet access, SAT TV, direct dial phone, minibar, ironing set, safe, bathroom with bath-tub and hair, child free of charge when sharing a room with 2 adults, coffee and tea making facilities. Free internet access in each room & free Wi-Fi in public area, PC corner for free in the hotel lobby, valet parking – 20 EUR / day – 5 minute walk away, front desk 24/7, room service, concierge services, flower service, hotel taxi service, pets welcome, laundry & ironing service. 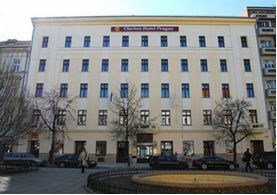 The hotel is conveniently located near the famous Wenceslas square, the very centre of the Prague, and only one metro station away from the Prague Congress Centre. From metro station I.P.Pavlova situated 2 minutes walk away from the hotel take a metro (line C) and go 1 stop to the metro station Vyšehrad. Prague Congress centre is located next to the metro station. The journey should take up to 5 minutes.